Archive plugin version 1.2 for Geeklog. Allows you to create a flexible database linking together items from other plugins. Incorporates AJAX features. Dutch translation for the calendar plugin. Net tools for Geeklog whois, nslookup, ping, tracert. This version has the latest phpWhois (4.1.2). This is a beta release of the Rating plugin 2.2. Please read the readme.txt file and review the config.php file before installing. Bad Behavior is a set of PHP scripts which prevents spambots from accessing your site by analyzing their actual HTTP requests and comparing them to profiles from known spambots. Archive plugin for Geeklog. Allows to create a flexible hierarchical structure of cards/items in a database. Allows linking to items from other plugins (staticpages, images, forums, stories, calendar events, etc.). The SNL (Spam Number of Links) module is based on Dirks SLV module for Spam-X. This module checks the number of links a post has and discards it based on the maximum links allowed. To install, copy the 3 files in the zip too the spam-x directory under the plugins directory. Currently it is set to allow only one link per post, to change this open the file SNLbase.class.php and change the number on line 64 to the required number of links. This is a SAMPLE boilerplate plugin that installs and works for both MSSQL and MySQL. SLV (Spam Link Verification) checks all links in a post for spam. This is a module for Geeklog's Spam-X plugin to make use of that service. Updated version: Added a timeout option in case the SLV server doesn't respond in a timely manner. This plugin allows you to backup/restore Geeklog database WITHOUT using mysqldump(.exe). This is a tiny plugin to support an autotag for technorati. In version 0.1.1, you can use this tag more than once in one story. Version 1.10 of the phpBB-Geeklog integration. This is a repackaged version of Blaine's FAQ Manager plugin, containing an updated functions.inc (adds support for autotags, among other things), a rewritten index.php, and a German translation. 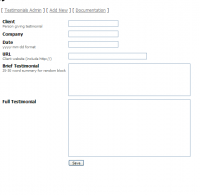 Testimonials is just that -- a plugin that will manage and display your customer/client testimonials. This plugin provides RSS feeds of your article comments. Exactly like the feeds of articles that Core Geeklog provides, but of the comments. A simple Flickr plugin that provides an autotag to display thumbnails of Flickr photos on your site and link them to their respective photo pages. This is a beta release of the Rating plugin 1.0. Please back up your database before installing. It will allow you to add a rating option to any item on the site. Inmemoriam is a media gallery plug-in designed specifically for Geeklog making use of Geeklog's user database as well as many of its core functions. Inmemoriam Media Gallery for Geeklog is an integrated, powerful, and secure gallery solution designed with Geeklog in mind.